The colorado diet called the State of Slim offers a 16-week plan to help you lose weight by following a healthy Colorado way of life. The diet’s authors, James O’Hill, PhD, and Holly Wyatt, MD, are weight loss researchers from Colorado, which has the lowest obesity rate of the nation. People in Colorado live in a way that supports natural weight loss. They are physically active on a daily basis and enjoy fresh and seasonal foods. But fortunately you can adopt a Colorado lifestyle – and lose weight easily – no matter where you live. Colorado provides a supportive environment for people to live a natural, healthy lifestyle. Activities such as skiing, hiking, and cycling are popular and often an opportunity for social interaction. An important reason why people in Colorado weigh less is because regular physical activity keeps their metabolisms revved up. This makes it easy for them to burn off whatever they eat. You have to cut your calories temporarily in the beginning to lose weight. But regular exercise is the only thing that will repair your metabolism. Once your metabolism is adjusted you can continue with the Colorado lifestyle and add more variety of foods to your menu. The key to long-term weight loss success is to savor healthy living and to do it in a way that brings you happiness rather than deprivation. You will cut 1000 calories from your average diet simply by eating the right foods in the recommended portions. At the same time you gradually increase physical activity by walking and becoming generally active. You can expect to lose 8-10 pounds in this phase. The diet emphasizes vegetables in the beginning because keep you feeling satisfied without a lot of calories. They also provide vitamins, minerals and other nutrients to keep your immune system strong and support an active lifestyle. The first phase is high in protein, but restricts the intake of carbohydrates and fat. You will continue to lose weight and strengthen your metabolism, while increasing the variety in your diet. You can now eat a small amount of fruit as well as foods containing a little more fat and starchy carbohydrates. Because your metabolism is improving you are allowed one indulgence meal a week. You will continue to lose about 1-2 pounds a week. By now your body has been trained to burn carbohydrates so you can add more sugar-containing fruit and starchy carbs. You are also allowed two indulgence meals a week where you can eat anything you want. Chicken breast, turkey breast, tuna, cod, tilapia, salmon, lean beef, egg whites, nonfat plain Greek yogurt, fat-free cottage cheese, fat-free milk, almond milk, protein powder, oatmeal, pumpkin, asparagus, broccoli, green beans, zucchini, salad greens, apples, berries, grapefruit, walnuts, olive oil, canola oil. Physical activity is not optional on this plan. It is the key for repairing your metabolism and achieving permanent weight loss. You can choose between two activity plans. Both are equally effective and you can switch between them if you like. On the structured plan you work up to 70 minutes of physical activity a day. On the flexible plan you will do 35 minutes of planned activity 6 days a week, while moving more in your daily life and tracking your lifestyle activity with a pedometer. 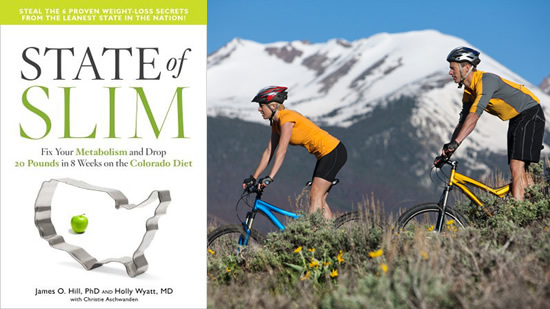 State of Slim: Fix Your Metabolism and Lose 20 Pounds in 8 Weeks on the Colorado Diet retails at $26.99. Diet has a track record of clinical success. Promotes the consumption of fresh vegetables and other unprocessed foods. Rapid weight loss in the beginning can increase motivation to stick with the program. Provides recipes for the three phases of the diet. Addresses the importance of an optimistic attitude and social support for positive weight loss outcomes. The first two weeks are very strict and require elimination of many foods. Encourages the use of artificial sweeteners, which may have an unfavorable effect on weight loss. This book promotes a healthy lifestyle such as that followed by people who live in Colorado. Staying physically active and eating fresh, wholesome foods will boost your metabolism so that weight loss becomes easy and permanent. is there a vegan version of this diet? I have this book and I can’t even find the word “vegan” in it, let alone an option for doing it as a vegan. To do phase 1 of the plan, your only source of protein would be in powder form.